by Shannon Clark in Family Budget | 20 comments | Contains affiliate links. If you’re sick of going over budget every month, make sure you’re not falling into one of these budgeting pitfalls. Instead, try these 6 ultra-simple tricks to learn how to stick to a budget at last. There are about a million articles online about how to make a budget. (Ya, I’ve even written a couple too.) But we all know, it isn’t knowing how to make the budget that is the problem. It’s actually sticking to it – that’s the hard part! My husband and I have learned financial stewardship the long and painful way over the years. We made our first family budget around the time that our first child was born. The first month that we were actually able to stick to it was just after he turned TWO YEARS OLD! Apparently I can be slow to learn and maybe a tiny bit stubborn sometimes. But hopefully that means you can learn from our mistakes without so much pain on your part! This post contains affiliate links to some budgeting resources I found helpful on my journey. Here are the simple tricks we learned along the way that allowed us to FINALLY stick to a budget and pay off our debt fast. If you go over budget every month, I can almost guarantee there’s at least one of these six practices that you aren’t doing yet. It’s never too late to start! Budget Mistake #1 – You budget for a ‘normal’ month. When I started my budget, I thought I’d do it once and then follow it every month, but guess what! That ‘normal’ month never came. There were always things popping up outside of our regular monthly expenses that threw me over budget. Here’s what I learned to do instead. Rather than making a theoretical budget for the perfect month that, um, never actually happens, make a new budget every month for the month ahead. In other words, don’t make ‘A’ budget, make a January Budget, a February Budget, and so on. This will help cut down on unexpected expenses because you only have to plan one month ahead. There’s no way you can see all the unusual changes to your income and expenses will happen this year. However, chances are you already have a fairly clear picture of what in the month ahead. That is what you should plan for in your monthly budget. This is especially true for energy bills which are sent the month or so before they are due. You can also get a good idea of any upcoming medical costs when you receive your explanation of benefits ahead of getting the actual bill. This way you can plan ahead for any “surprise” expenses for the upcoming month. If you know you’re going to have to spend more than usual on energy, doctors visits, you’re moving, or your income will be less than usual, you can plan to spend less in other areas to make up for it. Budget Mistake #2 – You don’t budget every dollar. The concept of the zero-sum budget is simple but powerful. Your expected income should exactly equal your budget expenses. Tell every single dollar where to go at the beginning of every month. This emphasizes the fact that you don’t spend more than you make. It also ensures that if you do have a bit left over that it goes to something like paying off debt, savings, or retirement instead of an extra dinner out or into thin air. 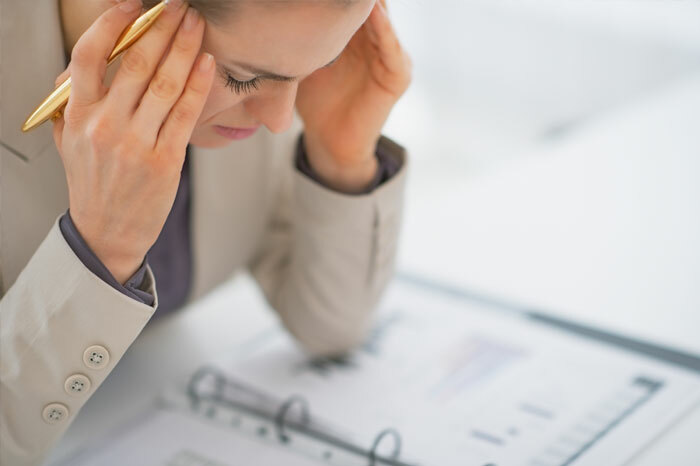 Budget Mistake #3 – You forget to include commonly forgotten expenses. Don’t be caught by surprise! Instead, plan ahead even for non-monthly expenses like new tires, school supplies, and Christmas gifts. Make sure to include commonly forgotten expenses in your budget. For instance, if you put away $8 per kid into your sinking fund each month, you’ll have $96 ready to pay for back to school supplies in August. Save another $4 per month and you’ll be ready to pay for $48 of online tax prep when April rolls around. This saves your monthly budget from taking a $50-100 hit every time one of these unexpected expenses comes up. Do the same thing for car registration, to help you with your Christmas budget, and on and on. After all, none of these are emergencies, and you ideally shouldn’t rely on your emergency fund to cover them. By planning ahead, you will eliminate all “surprise” expenses and stress from your budget! Budget Mistake #4 – You aren’t using the envelope method. Budget Mistake #5 – You buy what you need. One day we were shopping for Christmas presents. One of the items on our list cost more than expected and was no longer in our budget. 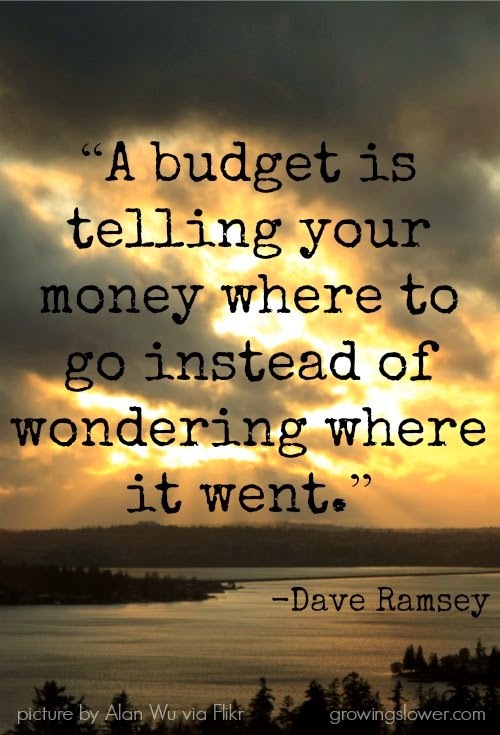 While it was disappointing not to be able to give what we wanted to our family, my wise husband turned to me and said, “If it’s not in the budget, it’s not in the budget.” This has become one of our family’s quirky little sayings that helps us remember to stick to our budget. In other words, if the money isn’t there, it really doesn’t matter if you think you need it. It doesn’t matter if you know you need it. You don’t spend the money. No matter what. Instead, you have to get creative. Need to take a gift to a kids’ party? Look around the house for something that would work or make something. Kids outgrew their clothes again? Swap with another family. Most of the time, looking back, you realize that it was a want and not something that you really needed. Then again, we’ve done some pretty crazy things to stay on budget that I’ll have to tell you about sometime. Even still, the peace of mind we got from staying on budget was always worth it! Budget Mistake #6 – You don’t know where you’re going. Pinching pennies just for the sake of being frugal is just crazy, but that’s what so many of us do. One of my most popular posts is a list of 97 Easy Ways to Save Money. Everyone’s looking for ways to save money, but if you don’t have a plan for the money you save, what’s the point? Instead, start working towards a financial goal, perhaps getting out of debt, building up an emergency fund, or putting money away for retirement. Make sure it’s a clear goal with a specific dollar amount, so you’ll know when you actually achieve it. I can speak from experience in saying that it can be very motivating to see that loan repayment amount go down, down, down every month! It wasn’t until we set a goal to become debt free that we finally started staying on budget! How to Stick to your Budget at last! Well, a lot has changed since we made that first budget when our oldest was born (including bringing his little sister into the world!). It may have taken us two years of his life to finally learn how to stick to a budget, but less than a year after we finally figured out these simple tricks, we paid off $22,000 in debt to become debt free! These subtle changes to the way you budget really can bring about dramatic results! What’s your biggest challenge that makes it tough to stick to a budget? Share your story in the comments! Very cool post! I really like the “sinking fund” idea! The sinking fund has really made a huge difference for us! It all stays in our normal checking account, and I just manage the amounts that we’re accumulating on mint. Great tips, budgeting couldn’t be more important than it is today. We all need to focus on living within out means and paying off our debts. The current spending trends are not sustainable and we will pay for it if we don’t start managing our funds better now. Yes, yes! To me the biggest benefit of living with our means and working towards being debt free is the huge amount of stress that is taken away. Once we started on our plan, my hubby and I both breathed a big sign of relief! My husband and I do all of this. I dreaded the envelope method, and now I love it! Which way do you do the envelope method Sasha? We thought about doing cash, but it just really doesn’t work for our lifestyle for many reasons. Instead, we do a digital envelope system and it works really well! We switched to a cash budget system and get into a lot less trouble than we used to. IT is amazing how quickly money disappears when you buy little things you don’t think will matter… until it is too late. That “sinking fund” idea is genius! On our debt free quest, the main bumps we hit are from forgetting the little things month to month. A sinking fund would definitely help with that! Yea! I hope that helps you! I think I picked that up from one of the Dave Ramsey books, and it has really made a huge difference in my stress level when it comes to our budget. Budgeting is something my family struggles with. I think the hardest part is not having a steady income or rather, not knowing what it will be. Oh friend, we have struggled! I just want to encourage you to keep on trying. It took us so long to finally get this figured out, but the peace of mind is so so worth it! If I remember right Tsh Oxenreider talked about budgeting on a variable income in her Notes from a Blue Bike. I think she said they take their lowest income for the last 6 months and base their budget on that. In our family we base our budget on my husband’s base salary because that is predictable, and any extra work at home income that I make goes to loans (soon to be paid off) and then our emergency fund. Hope that helps get you started at least. I love our sinking funds. We have so many. It makes budgeting so much easier for sure. I agree with Jessica. It’s really difficult to budget when you do not have a steady income. What we have found to work best is to set aside large amounts of money that come in at sporadic times and then separetly determine how much we want to pull for each month. Then budget from that amount. I feel your pain though, girl! Budgeting allows us to easily tackle the more expensive items too. Things like, buying organic groceries are now becoming easier to stomach the more expensive price tag. Love the sinking fund idea. That is where we come unstuck each week! How do you keep track of your sinking funds? Do you use cash, or have separate bank accounts for each fund? Alissa, we actually have one ‘sinking fund’ bank account that holds all of the different funds, and I track the individual amounts using a spreadsheet. 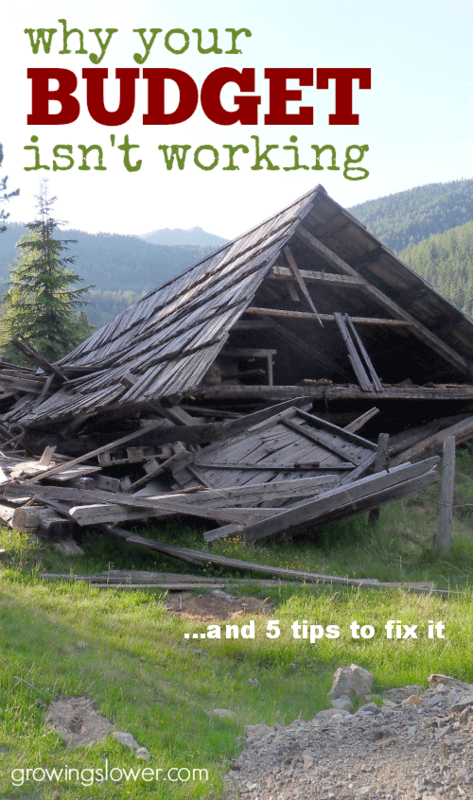 I have a whole post about how we track our sinking fund here. 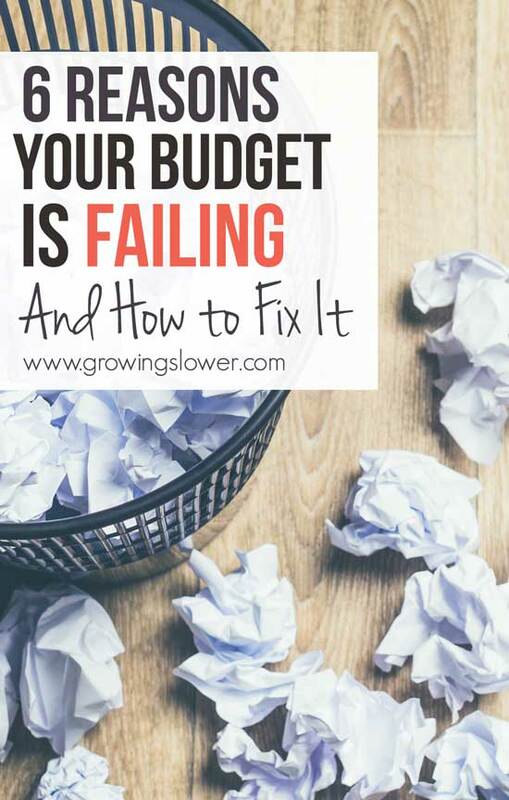 “Budget Mistake #2 – Use a zero-sum budget system.” This sounds like using a zero-sum budget is not helpful, but your explanation seems to be in support of it. Could you clarify? Oh my goodness Rebekah! You’re right that is totally confusing! Yes a zero-sum budget is absolutely critical to a successful budget! I will reword so it makes sense. Sorry about that! Having learned to budget and paid off debt ourselves, I love seeing stories from others about this topic. And it’s always interesting to see the differences! For example, your “mistake #1” is what we do, and what works perfectly for us! I keep a running budget–and even pay a bit extra on things like electric and water that may vary, just so that I can keep my budget the same each month. It would drive me crazy and be so stressful for me to have to create a whole new budget every single month. In fact, one of the things that I love about having a budget is the ability to “set it and forget it.” I re-evaluate it when new expenses are added, but otherwise I barely have to think about it and I love it that way. After a few months of scrupulously recording every penny spent and saving up, using many tips I got from your blog, we have finally reached the “1-month ahead” point! It is so nice to have concrete numbers to budget, vs estimated income, panicking if someone took a sick day, etc. One of the most helpful things I have been using is a Capital 360 account, with its virtual envelope system. For utilities that vary throughout the year, I tallied up my bills over the last year, then divided the total by 12. I pay that number ($128 for example) on my electric bill every month no matter what. If my bill is less than $128, I put the remainder into my “Electric” virtual envelope. If it’s over, I withdraw money to cover the balance. Same thing with annual expenses, like my Amazon Prime account or auto registration. I divide the payment by 12 and put it in my 360 account until I need it. Sooooo relieving not to have to stress when these things come up! I am in so much debt it depresses me. I am trying to pretend like I am working on getting myself out of debt; but, all I am really doing is wasting paper by printing out different budget sheetsand family binder inserts from pinterest. Seriously, how do you budget and pay off bills when you are broke. We make enough money to live ok if we didn’t have debt. But, we do and it hangs over me (because its mostly mine) like a dark cloud. WERE DO I HONESTLY START? The money we make covers today’s expenses, not yesterday’s mistakes.